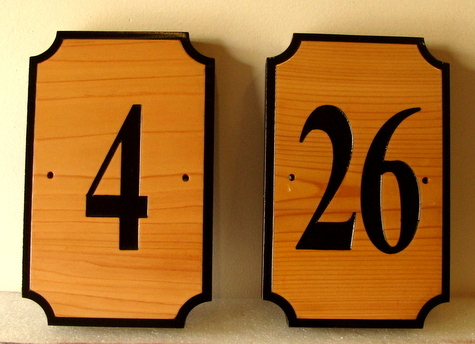 Above are shown two carved naturally-finished Western Red Cedar wood room number plaques for an Inn. These attractive room number plaques feature engraved text and naturally finished Cedar (i.e., no stain) smooth backgrounds .These plaques and similar ones can also be made of stained and painted wood of variousother types (e.g., Redwood, Oak, Maple, Mahogany, Cherry) , or painted HDU. The plaques are hand-painted , with black paint on the number and border, and then clear-coated. These room number plaques can be easily mounted on a hall wall or door for the room.